Can anyone book Ultimate NZ? Yes, anyone can book Ultimate NZ. There are various visa options depending on your reason for travelling to New Zealand. If you are not a passport holder of any of the above countries, you may still participate in our New Zealand program, however you cannot undertake any paid work whilst in New Zealand. In this case we can replace the work and mail support components of the tour with additional fun activities for you. 3-month Tourist Visa. If you’re from a visa waiver country you will not need to apply for this visa. 6-month Tourist Visa – available for British citizens and/or British passport holders. What do I need to plan my trip to New Zealand? Book your Ultimate NZ package and get in touch for help planning more New Zealand trips! Pack your bag, grab your passport & camera and jump on that plane! You must have access to sufficient funds to support yourself for the initial stage of your holiday in New Zealand and you may be asked to show evidence of this upon arrival. We suggest arriving in New Zealand with an equivalent of at least NZD$5000. The amount you need will depend upon your travel plans and length of stay in New Zealand. 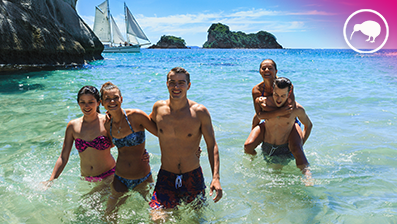 Ultimate New Zealand is designed to help you make friends as soon as you arrive in New Zealand! Most people doing Ultimate New Zealand arrive alone and stay in touch with friends from the group for the rest of their trip. You’ll spend your first week having loads of fun and getting to know each other. After the week is up we can advise you on how to find a shared apartment in Auckland or continue travelling New Zealand together. How far ahead should I book Ultimate NZ? We recommend that you book your Ultimate New Zealand package sooner than later as dates do book out, but no worries if you’re late to make plans, we can help you out with last minute arrival arrangements. What happens after I book my package? After booking you’ll be contacted by a Work & Travel Expert at Ultimate New Zealand who you can email with your questions at any time. We’ll email you a confirmation of your booking showing your mailing address, accommodation details and an airport shuttle bus voucher. All you have to do is book your flights and we’ll take care of the rest! No worries if your flights are delayed, just email us or give us a ring. We will let the hostel know and arrange an adjusted airport pick up! Plans can change and we’ll try to help as much as we can. Click here to read our full booking policy. How does the Airport Transfer work? We’ll pre-arrange your Airport Shuttle and email you a voucher with details instructions and contact number in case you get stuck. Your driver will be waiting at the ‘Meeting Point’ at Auckland Airport arrivals area, just outside the customs area. You’ll be dropped-off at your hostel in no time. How do you help me find jobs? Ultimate New Zealand includes New Zealand’s best job service for travellers; Travellers At Work! Upon arrival, our Work & Travel Experts will spend time with you to establish what kind of jobs you’re looking for and where and when you’d like to work. We’ll review your CV and help you adapt it to suit Kiwi employers. We’ll provide you with access to the Travellers At Work job database, so you can begin applying for jobs at your earliest convenience. If at any time you need some guidance just swing by and have a one-on-one session with one of our TAW reps who can help you out in your job search! Yes, its very important. Travel insurance is not included in your package but can be arranged easily by clicking here. Can you help me plan my trip around New Zealand? Our Work & Travel Experts have been everywhere and seen everything in New Zealand, Australia, Fiji & Southeast Asia! We can plan or book everything for you and are happy to give you unbiased travel advice! No matter where you want to go and how you want to get there we’ll be able to help plan out the adventure of a lifetime for you! How do I pay for Healthcare when I’m working and travelling in NZ? The majority of travellers to New Zealand cannot benefit from publicy funded health services in NZ. Valid medical and comprehensive hospitalization insurance will need to be obtained before your visa is granted. Check out our recommended insurance options and get a quote here. I want to stay in Auckland for a while; can you guys help me find a place? Yes, we can help you find somewhere to live in Auckland if you decide to stay on after the tour. Your tour guide will be happy to talk through your options with you. How can I get a 2nd-Year Working Holiday Visa extension? If you are a UK or Canadian citizen already in New Zealand with a working holiday visa, you can extend your 12-month visa to 23 months. In order to do this, you must continue to meet the requirements for the visa, you’ll need to manually fill out an application, get the relevant medical check, and send the application to Immigration NZ. If you transfer money through your bank, you could end up losing hundreds of dollars in fees. We have partnered up with Student Transfers who provide a faster and cheaper way to transfer money internationally. Student Transfers is dedicated to helping working holidaymakers and allowing them to transfer their money cheaper and faster than using their banks, which will saving money on better exchange rates and lower transfer fees. You can now easily transfer your money to New Zealand, Australia & Canada! Register here for free, view live rates and see how much money you save. Once happy with the exchange rate, book the payments and job’s done and money saved! As a working holidaymaker in New Zealand you may be eligible to receive a tax refund with an Inland Revenue Department number. Our tax refund experts will help you with everything, so you’ll get the maximum refund possible. 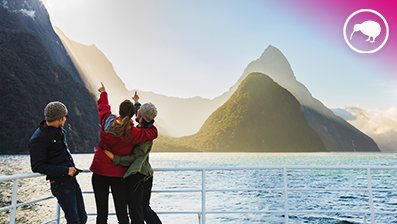 Learn more about New Zealand and all the amazing things it has to offer.